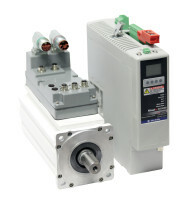 Our Bulletin 2094 Kinetix 6000M Integrated Drive-motor systems combine the high-performance MP-Series™ food-grade servo motor and Kinetix 6000 servo drive technologies into a single, compact package. This system provides significant space savings and machine control system simplification. This on-machine solution integrates seamlessly with our Kinetix 6000 and Kinetix 6200 multi-axis servo drive systems and is designed to help reduce wiring time and simplify cabling. Safe Torque-Off is certified at SIL2/PLd when used with a standard Kinetix 6000 safe-off header. Prevents drive restarts after the safety circuit is tripped.